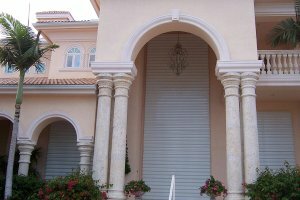 Removeable Storm Shutters | Willard Shutter Company Inc.
Removable storm shutters and panels are designed to be “put up” in the event of a hurricane or storm by placing them into a pre-installed panel mounting system over a window, door, or other area to be protected. The mounting system may incorporate a “direct mount” hardware combination, or a more convenient, header and sill track. Economical and easy to use, these products protect against flying debris and water penetration associated with hurricane force winds. Additionally, panels are available in various materials to suit application and budget. They are typically taken down and stowed away when not in use. 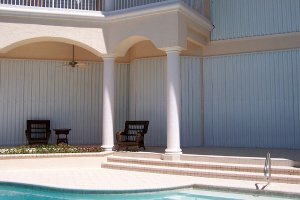 Designed with convenience and storage in mind, removable storm shutters and panels are a huge advantage and recommended alternative to cumbersome “homemade”, plywood shutters. Panels come in aluminum, galvanized steel or see-thru polycarbonate materials. Aluminum panels are typically used in residential applications for the inherent light weight. 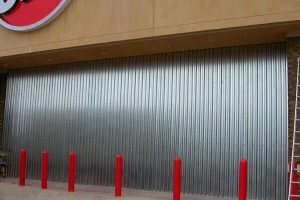 Steel panels are more commonly used on very large commercial applications such as storefronts. Where needed, Willard provides a clear polycarbonate alternative to allow light to pass though the storm shutter. While effective, clear panels pose some limitations over other materials available, and consultation is recommended before specifying. 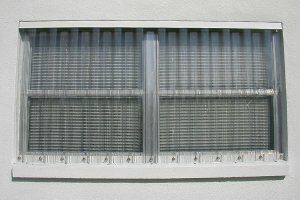 Panels may be installed using washer wing-nuts or spring clips. Spring clips are made of ¾ hard, 304 stainless spring-steel. Preferred track mounting hardware is a 410 stainless steel, ¼” diameter Tapcon® typically provided with tracks. In direct mount or removable track applications, hardware shall be nickel-plated brass, or stainless steel machine screw in conjunction with brass insert. In all cases, header and sill tracks are mill extruded, heavy duty, 6063-T6 aluminum alloy, and cut to specified lengths based on the number of panels to be used per opening. They are typically provided with pre-determined, “factory drilled” mounting holes to facilitate simple and accurate installation. The extruded aluminum tracks are mill coated with a modified, acrylic/polyester enamel and cured at 400°F. All mill coated finishes pass recommended ASTM and AAMA standards testing.